Showing results for tags 'vectorscript'. New layers script + date + separation layer. When adding scripts to worksheets, there is a dialog box that pops up every time saying would you like to block or execute scripts in this worksheet? Question: Can we somehow block or execute this option, through a script? Greetings all, Trying to figure out how to access viewport class overrides through vectorscript. So far all i've found on the developers wiki are GetVPClOvrdCount GetVPClOvrdFillBack GetVPClOvrdFillFore GetVPClOvrdFillOpty GetVPClOvrdName GetVPClOvrdPenBack GetVPClOvrdPenFore GetVPClOvrdPenOpty Which seemingly addresses fill front/back and opacity together with the pen front/back and opacity. What about line types/pen thicknesses/textures? I would like to know the largest orthogonal rectangle to fit within any handled polygon or polyline. Within that one might fit a textblock or other. Could I script this using VectorScript? I've been scouring the internet for any indication as to how to go about creating a record format that auto-populates the extrusion length of a symbol...and I've had no luck. 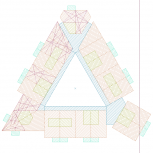 But I just saw this script posted on another topic: https://forum.vectorworks.net/index.php?/topic/46334-help-with-auto-record-formats-fields/ and I was wondering if anybody could help me alter this to work for my purpose. I have a number of 2D shapes that I often extrude and then make into symbols. These symbols then act as the structures of trade show displays that I help design. As there are a number of similar objects in these structures, I'd love to be able to run a report that includes the length that I've extruded the symbols. Or any other suggestions as to how to get a similar result would be greatly appreciated. Thanks!!! Hello, all. Looking at the VectorScript function reference I see no functions that could tell whether a given polygon/polyline is self-intersecting. The only function that is told that it is the VS:OffsetPoly. But I don't want to see if a polygon/polyline is self intersecting as a side effect of an operation that actively acts on the selected object but just a read-only operation whether it is self-intersecting or not. Any suggestions are welcome.